Which company does a creator like Scott Cawthon turn to for toys based on a property with powerful mass appeal but tons of creepy evil? Five Nights at Freddy’s had McFarlane Toys written all over it, and so will the boxes of the upcoming construction sets. Makers of the creepy action figures my wife keeps in the bedroom that will one day give my children nightmares, McFarlane Toys is the perfect company to create construction sets based on the video game series that’s been giving gamers young and old nightmares over the past few years. They’re kind of a nightmare factory. That’s a compliment. I promise. And the nightmare factory that comic book creator Todd McFarlane built (never did get that gold Angela figure) will be producing a series of sets based on the animatronic horror show, which should be hitting stores this summer. We scored an early look at one of sets, that monument to the joy of ignorant children, the Freddy Fazbear’s Pizza Show Stage. Come on down, join the fun, maybe get murdered and stuffed into a suit. You know, for the kids. During the day, the Show Stage at Freddy Fazbear’s Pizza is full of bright lights, happy children and singing animatronics! However when the night shift begins at midnight, the deadly horrors come to life. 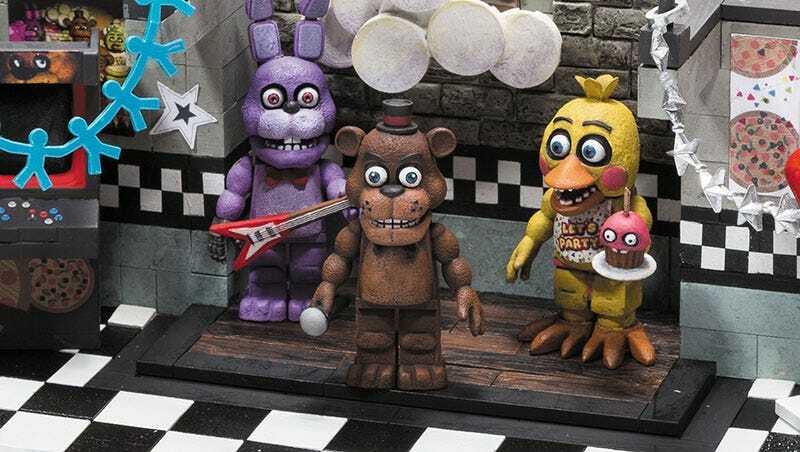 Starting from center stage, Freddy, Bonnie and Chica animatronics start to roam around the Pizzeria and head right to the Night Guard’s Office! The Show stage set features 3 figures (Freddy, Bonnie & Chica), party balloons, arcade cabinet, star streamers, happy birthday banner, party stage, decorative clouds and stereo speaker! While the set in this picture is still a prototype, it looks pretty damn impressive. The figures are particularly cool, capturing the creepiness of the video game characters spectacularly. McFarlane Toys CEO and owner Todd McFarlane says they struck the perfect balance between cute and creepy. I suppose? I mean, you can only get so cute where a duck (or chicken, fine) with teeth is involved. Ever see Jim Henson’s Pajaminals? On the left, a duck with teeth. No sir. The Show Stage Construction Set is the largest of four sets in the first wave of Five Nights at Freddy’s sets from McFarlane, with additional sets connecting to it to eventually form the map from the game. I’m really looking forward to these. I loved what McFarlane’s done with The Walking Dead building sets, sort of like building a model without all the tedious bits. Plus maybe I’ll get further into the Five Nights at Freddy’s series if I have physical representations to punish for the jump scares. Aw, who am I kidding? I’d buy them for the cupcake alone. Toy Fair is coming up this weekend in New York City (I’ll be there), so keep an eye out here and over at the McFarlane Toys website for more info on creepy possessed animal robots.